Ann Krenek and her Sun Tricycle are fixtures on the tree-lined streets of the Ladd’s Addition neighborhood across Hawthorne Blvd from RecumbentPDX. 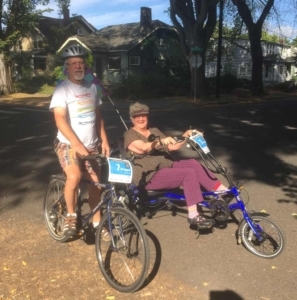 Early-onset Arthritis resulted in a total hip replacement, so the trike allows her to exercise, shop and occasionally get out for rides with her husband, Dale. This past summer, we were in on the action as Dale plotted a birthday surprise: an electric assist motor for the Sun. The motor allows longer rides together –though Ann teases Dale that he now slows her down. In late 2015, Anne had surgery to repair the rotator cuff damage caused by years of cane use. While she recovers, we see Dale out on the Sun with Sammy, their pit bull puppy, in tow. We caught up with John just before the New Year. Despite slight lingering lower leg paralysis, he continues to thrill folks at the Ketchum YMCA by powering through spin classes and, incredibly, re-mastering the climbing wall. John tells us he looks forward to plenty of trike riding in the coming year.